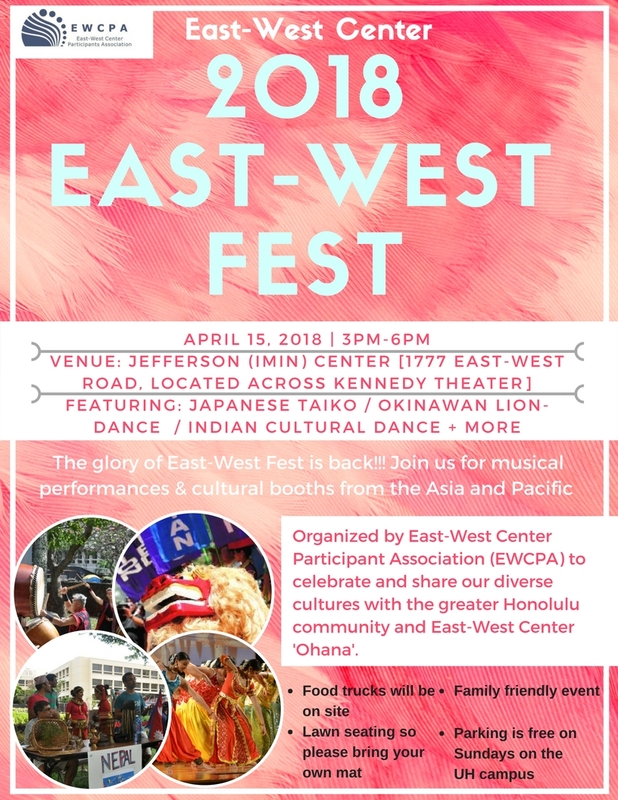 HONOLULU (March 22, 2018) – The East-West Center Participants Association is hosting its 2018 cultural celebration, East-West Fest, on Sunday, April 15 from 3:00 to 6:00 pm at the Hawaii Imin International Conference Center at Jefferson Hall on the East-West Center campus. This year’s East-West Fest is set to be bigger than before as it brings back East-West Fest to its glory days, specifically its time during the 1960’s and 1970’s, when it is held in Imin International Conference Center. The local community is cordially invited to join in this celebration of cross-cultural understanding. The festival will also include cultural booths representing a variety of countries along with performances of Asia Pacific dance and music. Besides student performances, the event will also feature well-known, professional groups which will perform acts such as Okinawan Lion Dance, Indian Cultural Dance, and Kenny Endo’s Taiko Ensemble. Admission is free and open to the public. There will be food trucks and international refreshments and snacks. Free parking is available Sundays on the UH Manoa campus. The event will be lawn-seating. Click for photos from a previous East-West Fest event. Please click here to look at the Visitor Parking Map – IMIN.